I think this is such a great shirt. The boy who will be wearing this shirt is also a red head, hence the red head pirate. The boy is having a pirate themed birthday party. I thought this was fitting. Interested? $35 Email me at kirshaq(at)gmail(dot)com. If you are not local, I can ship this to you and you can pay me via Paypal. This is a horrible picture, but the shirt is darling. 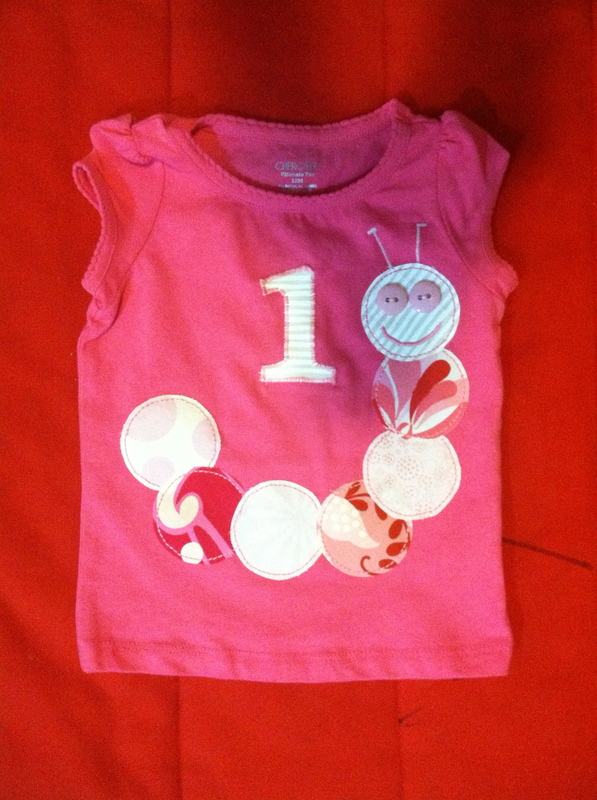 What a fun way to celebrate your baby’s first birthday by wearing a 1 on her shirt with a darling caterpillar. If you don’t like the color combo, email me with the colors you would like. Interested? email me at kirshaq(at)gmail(dot)com. What a fun way to celebrate turning 5! I love the button eyes and the way the greens and the blues go together. Interested?? $30. Email me: kirshaq(at)gmail(dot)com. If you do not live near me, you can pay me via Paypal and I will ship it to you. I can have this shirt ready to be shipped in 24-48 hours.